The continent-spanning city of North Am is a miracle of ingenuity and ambition, a technological paradise where "milespires" pierce the clouds and robots perform virtually all labor, freeing humankind to pursue leisure and bliss. But in the shadows of the sun-drenched towers, human mobsters use robot muscle "thug -- bots" to terrorize the citizenry of North Am. Human trafficking, illegal psychoactive substances, violent crime, and corrosive corruption are suddenly epidemic in the glittering utopia, with only the mighty Robot Fighter to stand against them. 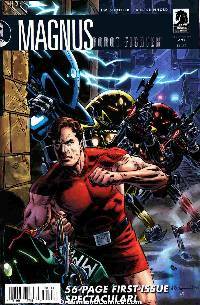 When a wealthy heiress is kidnapped, Magnus is drawn into the mob's deepest sanctuary, where Magnus faces the fight of his life against the immensely powerful half robot, half man known as Big Guns. Dark Horse Comics proudly presents the rebirth of one of comics' most iconic heroes, Magnus, Robot Fighter! Reimagined for the twenty-first century by superstar scribe Jim Shooter and illustrated by Bill Reinhold (The Punisher, Wolverine: Origins), Magnus, Robot Fighter #1 joins Doctor Solar, Man of the Atom and the upcoming Turok, Son of Stone in the most exciting launch program of 2010! * Special bonus for this 56-page issue: the very first Magnus story from 1963! * Written by Jim Shooter!